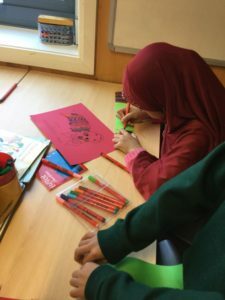 Latest News: St Agnes’ children celebrated Chinese New Year 2017! Kung Hei Fat Choi! Happy Chinese New Year! It’s been an exciting week at St Agnes as we have celebrated Chinese New Year alongside Arts Week! As a part of our Rights and Responsibility work and Peace Mala accreditation we have been learning all about Chinese New Year and the traditions of the families who celebrate it. Using our Peace Mala Bracelet to focus our thoughts, we learnt that the Buddhist Community celebrated Chinese New Year and that this is the orange bead on our bracelet! We keep this message in our minds as we celebrated the wonderful festivities of Chinese New Year! 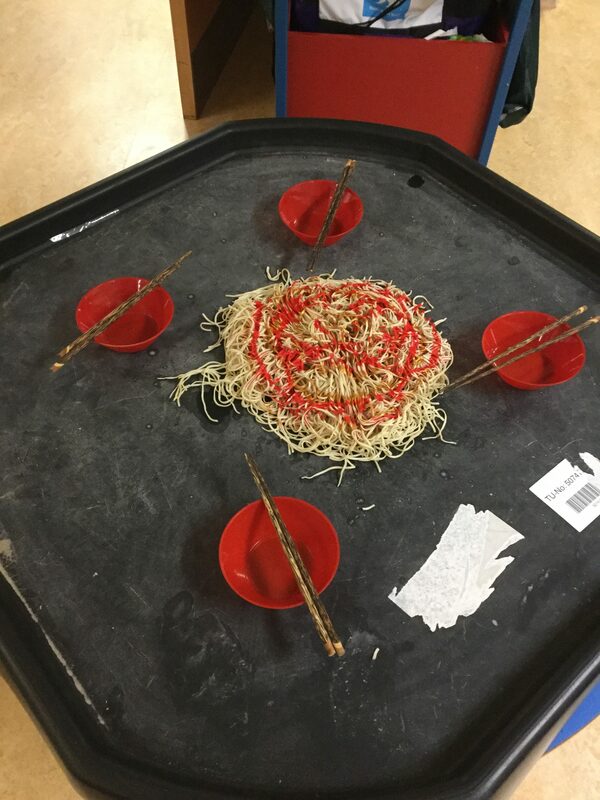 In Nursery and Reception, the children tried to pick up Chinese Noodles using Chopsticks from our water trays, painted Chinese Symbols, made Large Chinese Dragons to explore outside with, took part in Chinese Ribbon Dancing Sessions and made lucky money envelopes! The children had lots of maths challenges linked to the celebrations too, such as ordering the animals in the Zodiac Race into their ordinal places! 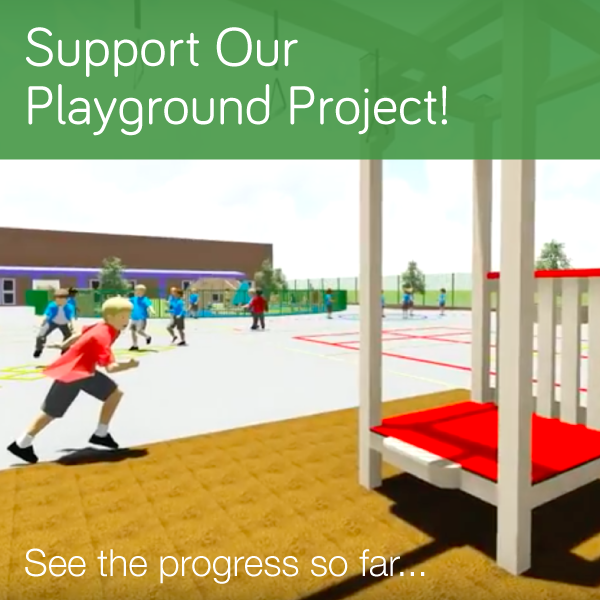 The children loved taking part in all activities and the staff and families have been thoroughly entertained by the children’s performances and knowledge of what happens at this time of year! In Year One, the children made Chinese Goldfish. They learnt it is tradition to clean the house carefully at this time of year. They also learnt that people hang lucky red and gold decorations that are hung over doors and around rooms. Year One made their own decorations a Chinese Goldfish represents wealth and prosperity because the actual word in Chinese for fish, in Pinyin means abundance. 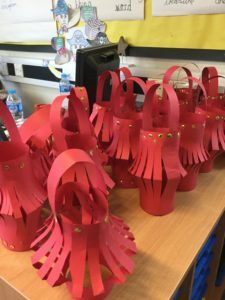 In Year Two, the children learnt about the Chinese Lantern Festival and had a go at making our own Chinese Lanterns. The children brought lanterns to brighten up the hall. We now know that Chinese families celebrate the end of winter by lighting the lantern and enjoy the fact that the sun is stronger as spring is getting closer. in Year Three, the children had been making their very own Chinese Dragons. They learnt that the dragon is also a symbol of power, strength, and good luck for people who are worthy of it. In Year Four, the children have been learning about Chinese Hand drums. They learnt Chinese drumming is an ancient form of music often accompanied by chants and choreographed movements designed to tell a story. In our special whole school performance, they played their Peace Drums loudly for everybody. In Year Five, the children have had the chance to make Chow Mein. They made this lovely dish, using Chinese authentic ingredients and then they had the opportunityto taste it. 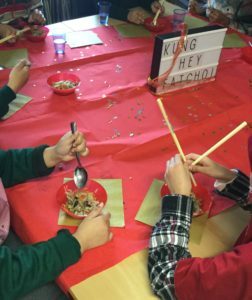 The teachers were extremely impressed with the children’s cooking skills and with their ability to use chopsticks after only being shown once! They were treated to a fine dining table to eat their meal as a special treat!